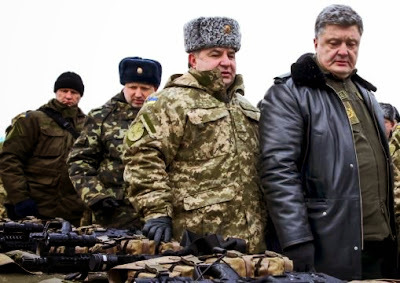 Ukrainian President Petro Poroshenko (R) inspects military hardware as he visits the Yavoriv military range outside Lviv, western Ukraine, Dec. 30, 2014. The military said rebels had carried out several mortar and small arms attacks on Ukrainian positions in the east. Local authorities in Luhansk region, bordering Russia, said rebel mortar fire had destroyed two homes in a village on Thursday, killing one civilian. There was no confirmation of these reports from the rebels. “New Year's night in the zone of the anti-terrorist operation was not a quiet one,” a statement by the military said. “Over the past 24 hours three Ukrainian soldiers were wounded as a result of shelling,” military spokesman Colonel Andriy Lysenko told journalists. More than 4,700 people were killed in 2014 in eastern Ukraine in a conflict pitting pro-Russian separatists against government forces loyal to Kiev's pro-Western government. The fighting has provoked the worst crisis in relations between Russia and the West since the Cold War. Ukrainian authorities and separatists have exchanged hundreds of prisoners of war as part of a 12-point plan to end the conflict. In a fresh diplomatic attempt to restore peace, Poroshenko is preparing to meet Russian President Vladimir Putin and the leaders of France and Germany on January 15 in Kazakhstan. The overnight New Year attacks underlined the fragility of a cease-fire that has theoretically been in place since early in September, though frequently violated. Poroshenko, who has acknowledged that Kiev lacks the military means to take back lost territory by force, told Ukrainians on Thursday that they had endured the worst year since the end of World War Two in 1945. “An angry enemy encroached on our lives, our territory, our freedom and our independence,” he said in a New Year's message on the presidential website. Warning that 2015 would “not be easy,” he said he expected it to go down in history as the year when Ukrainians would enact deep-seated reforms opening up the road to membership of the European Union. The commitment of Kiev's new leadership to European integration following the overthrow of a Moscow-backed president last February has set it at variance with Russia, Ukraine's former Soviet overlord, which wants to keep it within its political and economic orbit.